The Sense 51 delivers wonderful cruising and incredible stability thanks to a hull specially designed to lie low on the water. Well-being and simplicity are the watchwords on all seas and in all weather, making endless cruises possible. 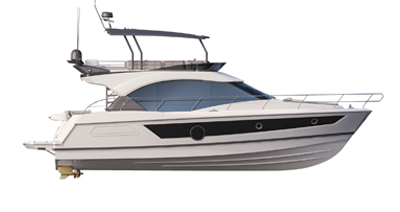 Three steps naturally link the exterior and interior spaces.Her bright and spacious saloon is ideal for spending time together.The aft cabins boast a perfect combination of space and comfort. The interior is fitted out by the talented Nauta Design with careful attention to detail.A choice between fruit-tree and matt walnut wood is available thanks to the expertise of the Beneteau cabinetmaking workshop. The Sense 51’s characteristic hull makes you feel very safe, yet is capable of good speeds at sea. 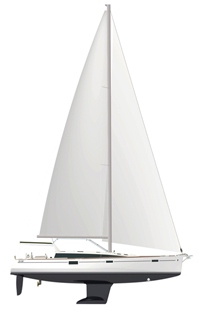 She is perfectly balanced under sail and highly manoeuvrable for short-handed sailing, delivering a good performance and outstanding seakeeping for a monohull. The ingenuity of the design and the use of noble materials envelop the Sense 51 in distinctly inviting atmosphere. As the cabins are located to the bow, the cockpit is situated lower on the water, increasing the sailing sensations. In addition to a huge amount of space, it also has a table that lowers to create an extra-large sun bathing area. You have a choice between a two-cabin and two shower rooms, plus a pleasant private office or three cabins and two shower rooms for your Sense 51. Whatever layout you choose, the owner suite is of outstanding quality: island bed, spacious private shower and lots of storage, creating really restful surroundings. Exterior galley with plancha and sink concealed in the helm seats. A semi-hard opening Bimini top is available and extra elements can be added to close off the cockpit completely. Swim platform that lifts to close making the cockpit safe under sail. Master cabin: island bed with marine mattress and slatted bed frame; lots of storage (up to 5 drawers, hanging lockers, etc.) and an ensuite bathroom with separate shower cubicle. Guest cabin: Large double bed – 1 ensuite bathroom also used as day-time toilet. Third cabin fitted as standard with 2 bunk beds. Built in long galley. Attractive grey synthetic resin worktop. Fully concealed electrical appliances when galley is not in use (retractable worktop on gas hob, panel in front of oven). Large porthole / service hatch opening onto the cockpit saloon (512 mm x 322 mm). Master cabin with ensuite bathroom, a second bathroom with access from the guest cabin and day-time access. Central furniture incorporating an extra seat for the chart table for 2 people and a retractable 32" TV on a motorized lift-system (option). Its location supports you in the galley when the boat heels. Master cabin: island bed with marine mattress and slatted bed frame; lots of storage (up to 5 drawers, hanging lockers, etc.) and an ensuite bathroom with separate shower cubicle. Guest cabin: Large double bed – 1 ensuite bathroom also used as day-time toilet. Extra cabin accessed by the cockpit. Built in fitted galley (lengthwise). Attractive grey synthetic resin worktop. Fully concealed electrical appliances when galley is not in use (retractable worktop on gas hob, panel in front of oven). Large porthole / service hatch opening onto the cockpit saloon (512 mm x 322 mm).